When I was growing up, the bulk of my collection ended-up being Majorettes. I grew up in a small town where there was one toy store, and it only stocked their 1/64 toys. Back then, I thought they were fantastic. Since I’ve gotten back into collecting, I’ve found Majorettes to be an extremely frustrating brand. They have a great selection of models, and are easily available in the UAE, but the castings look terrible. I’ve emphasized the word “look,” intentionally. I’m not sure what it is, but every time I’ve actually ended-up buying a Majorette, I’ve been extremely pleased. More so than a Hot Wheels or Matchbox. Is it the packaging? Is it how they’re displayed in-store (usually off in a corner on a dull red rack). I’m not really sure. 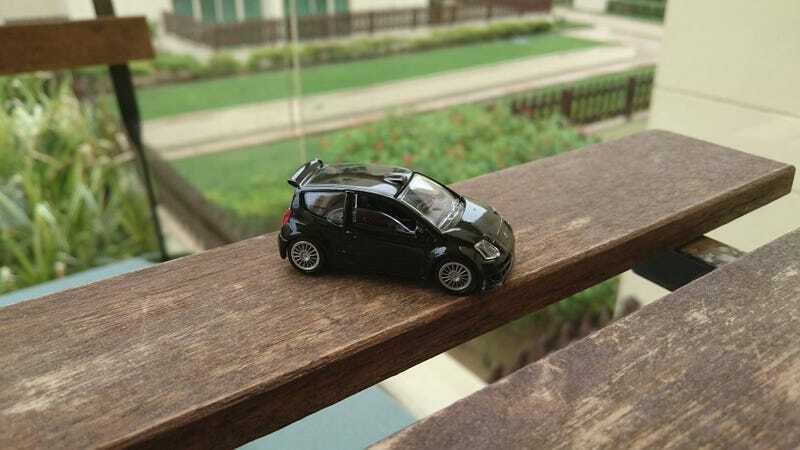 One of the best 1/64s I’ve ever gotten my hands on is this Citroen C2 (WRC?). The packaging looked no different than any of the other Majorettes, but when I took it to the check-out counter, it was a bit more expensive. When I pealed open the box, I understood why. There’s a high-level of detail (this appears to be a non-liveried WRC car, and you can even see the spare tire in the back). The scale also seems to be bang-on. I hold Tomica’s Limited Vintage line in high-regard, and the Citroen slots in neatly next to my Suzuki Alto and Toyota Century in terms of size. So what is it about Majorettes? Why do they look so awful in-store, but look fantastic opened-up, and displayed on your shelf? I can’t figure it out, but I need to start picking up more of them.